International, News, Soccer, Uefa Nations League Tagged Germany, Netherlands, Uefa Nations League. Virgil van Dijk, Memphis Depay and Georginio Wijnaldum all scored to earn Netherlands a 3-0 win over Germany and left Joachim Low’s men still without a win or a goal in the Nations League. However, Depay added an 86th-minute second on the counter-attack and Liverpool midfielder Wijnaldum rifled in a third in stoppage time, securing Oranje’s biggest ever win over Germany. It leaves Low’s side in danger of relegation in League A Group 1, of which they are bottom, having drawn 0-0 with France in their first game. Germany enjoyed a bright start as Timo Werner poked wide when through one-on-one before Jasper Cillessen denied Thomas Muller’s first-time effort. 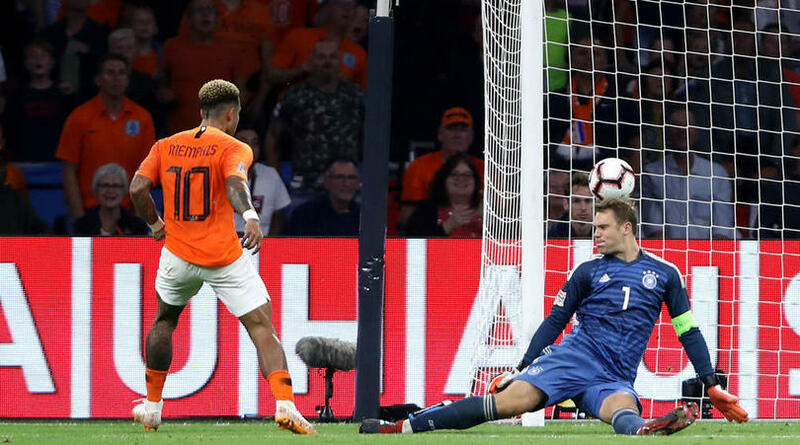 However, Netherlands went ahead in the 30th minute, Van Dijk nodding into the net having reacted quickest after Babel’s header from Depay’s corner came back off the crossbar. Sane was guilty of squandering the best of Germany’s second-half openings as he fired wide when it seemed easier to score having been put through by Joshua Kimmich. Low’s side were then denied a penalty when Groeneveld looked to have tripped Ginter from behind, but referee Cuneyt Cakir was uninterested. Depay then secured the victory with four minutes to spare, staying onside to collect Quincy Promes’ pass and finish past Manuel Neuer, despite the keeper’s best efforts. There was still time for Depay to hit the crossbar before Wijnaldum steered into the bottom-left corner of the net after bamboozling Jerome Boateng to give Netherlands a win over Germany by three goals or more for the first time in history. The 2014 World Cup winners were dreadful in their title defence in Russia yet decided to stick with Low. After two Nations League performances, there have to be questions about his ability to restore this team to the top of world football. Netherlands, meanwhile, look a force under Ronald Koeman. Netherlands were under the cosh for much of the second half but in Depay they had an outlet. Germany’s defence were constantly stretched by the Lyon forward, who kept his cool to add a crucial second. Germany were hoping that Werner would be their talisman in Russia, but he has not found the net since a June friendly with Saudi Arabia. He looked short on confidence here and Low needs a reliable goalscorer if he is going to turn things around. Koeman’s team travel to World Cup semi-finalists Belgium for a friendly this Tuesday. The Germans travel to France, the team that succeeded them as World Cup champions, for a meeting with the other team in this Nations League group. Posted in International, News, Soccer, Uefa Nations League Tagged Germany, Netherlands, Uefa Nations League.